By booking your Air Seychelles flight via SouthAffrica.TO you qualify to earn travel vouchers - simply email a writeup of your flight to cheapflights@southafrica.to and we'll email you flight discount vouchers - easy. Ask an Agent - our travel agents are itching to assist you! Use the flight bookings tool on the left to book a cheap flight with Air Seychelles. Air Seychelles was established in 1978 and operates 160 domestic flights a week. The airline started flying internationally in 1983 and now offers international flights to Abu Dhabi, Johannesburg and Mauritius, operated by an A330-200 aircraft. Air Seychelles has one motto, Flying the Creole Spirit. 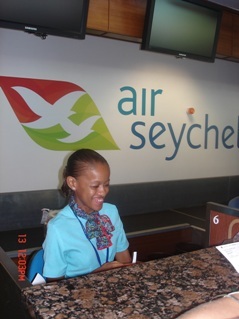 The staff of Air Seychelles want to offer every passenger flying with them a unique experience by adding their natural warmth and passion to the service they offer. In 2012 Etihad bought a 40% stake in Air Seychelles. Air Seychelles have been voted the Indian Ocean's Leading Airline for Business Class and the Indian Ocean's Leading Airline for Cabin Crew in the recent World Travel Awards for 2014. July 2014. Two DHC-6 Twin Otter Series 400 planes are received, for use on the island hops between Praslin & Mahe; as well as to Bird, Fregate, Denis & D'Arros islands. August 2014. Air Seychelles will take delivery of their first A320 in December 2014. This will increase flight capacity to 136 passengers. March 2015. Air Seychelles will launch thrice weekly non-stop flights to Paris from Mahe from the 1st of July 2015. This replaces their Paris flight that used to route via Abu Dhabi. They are also changing the schedule on their Mumbai and Mauritius flights from the 28th of April 2015. Finally they are adding a 14th flight between Abu Dhabi and Mahe to become a double daily service. Flights between Seychelles and Hong Kong will also become a daily service through their code-sharing with Etihad Airways. December 2014. 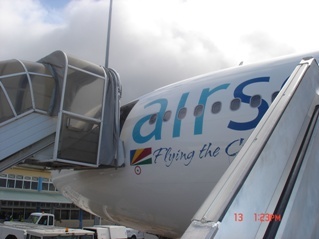 Air Seychelles recently started operating flights from Mahe to Dar es Salaam, Mumbai and Antanarivo. February 2014. Air Seychelles plans to commence flights to Paris-Orly Airport (subject to regulatory approval) via Abu Dhabi. 22 June 2018. From the 1st of July the airline will implement a new baggage policy, abandoning the piece concept in favour of the weight concept. Economy class passengers will be able to check in up to 30 kg of baggage and Business class passengers will be allowed up to 40 kg checked baggage. 11 July 2017. 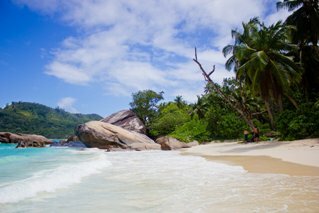 Air Seychelles has suspended their twice-weekly flights between Durban and Seychelles. Passengers already booked on the route will be accommodated on flights via Johannesburg in partnership with SAA. This is effective from the 27th of July 2017. 7 Nov 2016. Air Seychelles has announced that they will start operating flights from Durban on the 30th of March 2017. They'll operate two weekly flights on Thursdays and Saturdays, on an Airbus A320. The cabin will have 16 Business Class seats and 120 Economy Class seats. 13 Jun 2016. Air Seychelles has introduced a new luggage policy increasing the amount of free baggage for both economy and business class passengers from mot destinations. When none of these exceptions apply (as is the case for passengers to and from SA), Economy Breaking Deals and Saver passengers are allowed one piece of luggage weighing a maximum of 23 kg and Economy Value passengers are allowed two pieces of luggage weighing a maximum of 23 kg each. All Business Class passengers are allowed two pieces weighing up to 32 kg each. 18 Mar 2016. From the 28th of June 2016 Air Seychelles will operate an extra flight from Mahe, Seychelles to Antananarivo, Madagascar on Tuesdays. The additional flight will only be operated until the 10th of January 2017. The flight will be operated by an Airbus A320. “Upgrading Antananarivo to four weekly services will support the increased travel demand between our island nations in the Indian Ocean. 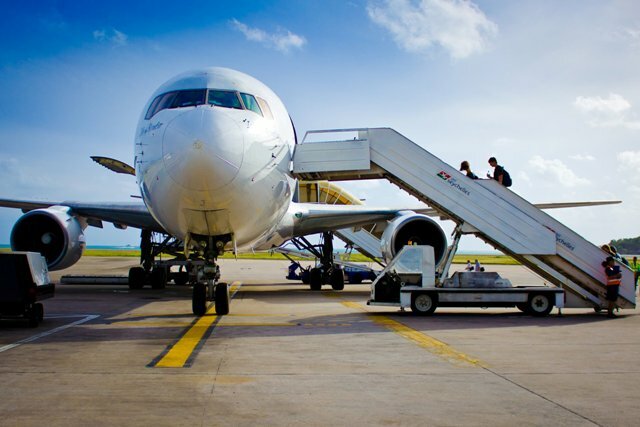 It will enhance connectivity for guests travelling between Madagascar, the UAE and India via Seychelles and also [enhance connectivity] to important cities in Madagascar such as Nosy Be and Toliara,” said Roy Kinnear, CEO of Air Seychelles. 1 Mar 2016. Air Seychelles are upping their Joburg flights from four per week to five times a week, now offering flights from Wednesdays to Sundays. This will be effective from the 17th of March 2016. 24 Feb 2016. Air Seychelles are increasing their flights between Johannesburg and the island to four times per week from the 19th of March 2016. They will discontinue their Dar es Salaam route from the 12th of March 2016. 1 Feb 2016. Air Seychelles are adding direct flights between the Seychelles and Beijing. The first flight will take off on the 2nd of February 2016, with only one direct flight scheduled each week. The route will be operated by an Airbus A330. 22 Oct 2015. Air Seychelles are adding additional flights between Seychelles and Johannesburg to accommodate the higher demand over the festive season. From the 15th of December 2015 until the 5th of January 2016, they will offen an additional Tuesday flight. At the same time, Air Seychelles have also made minor schedule changes to give passengers better arrival and departure times. 9 Feb 2015. Air Seychelles have signed a codeshare agreement with Air Madagascar. This will greatly benefit visitors to Madagascar and Seychelles as it gives a wider range of connecting flight options. 22 Sep 2014. 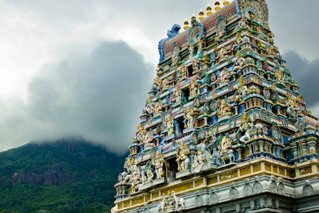 Air Seychelles have added another new route, from the Seychelles to Mumbai. They will launch their 3 weekly flights to India on the 2nd of December 2014. 16 Sep 2014. Air Seychelles added a new route with direct flights to Antananarivo, Madagascar. 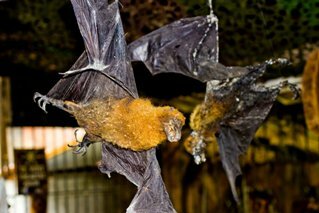 From the 3rd of December they will fly from Seychelles to Madagascar twice weekly. They will also use a A320 aircraft on this route with the capacity to transport 136 passengers, divided between Economy and Business Class. 9 Sep 2014. Air Seychelles will be flying to Dar es Salaam, Tanzania, from the 2nd of December 2014. They will use a relatively small A320 aircraft with 16 seats on offer in Business Class and 120 seats on offer in Economy Class. This direct connection will hopefully encourage both business and leisure travel to the islands. 29 Aug 2014. Air Seychelles has signed a codeshare agreement with Hong Kong Airlines which will see them extending their network in Asian and the Middle East. Air Seychelles will be placing its HM code on Hong Kong Airlines’ flights between Hong Kong and Bangkok. Hong Kong Airlines will then in return place its HX code on Air Seychelles’ flights between Hong Kong and the Seychelles and on their flights between Abu Dhabi and Hong Kong. 29 Jan 2014. Manoj Papa, a current general manager of SAA, replaces Cramer Ball as Chief Executive of Air Seychelles. Ball presided over the sale of 40% of the airline to Etihad, and forming a strategic alliance with them. 21 Nov 2013. Air Seychelles have signed a codeshare agreement with Cathay Pacific, which opens for travel from 9 December. Air Seychelles has expanded its codeshare agreement with SAA, and you can now book SAA flights on Air Seychelles' website to PE, Cape Town, Durban and Johannesburg. This is a win-win, as their customers get greater choice and Air Seychells accesses a new revenue stream. 3 Jul 2013. Following in the footsteps of its new partner, Etihad, Air Seychelles has outsourced to Accelya Kale its revenue accounting for pax, cargo, airmail and non-transport billing. They'll be processed on the FinesseMBS™ and REVERA® platforms. "Etihad Airways has seen outsourcing benefits from their engagement with Accelya Kale. Therefore, we decided to extend the relationship to include Air Seychelles. This has enabled us to standardize our processes across the group airlines, resulting in better monitoring and control." said the CFO of Air Seychelles, Ms Shelley Cole. 25 June 2013. Air Seychelles have shot up the Skytrax ranking list, and are now sitting at number 2 in Africa (previously number 10). “This is a significant achievement for Air Seychelles and further confirmation that the airline is moving in the right direction. To climb so quickly in the Skytrax rankings in such a short time is evidence of our team’s determination to be the best airline in the Indian Ocean and to fulfil Air Seychelles’ vision to be a high quality, profitable airline. The Global Airline Awards are based on traveller feedback, so it is pleasing to see that our customers are recognising the rapid progress we are making towards being the best airline in the region. The results demonstrate our commitment to training, our investment in our people and our product and further demonstrates the value of our partnership with Etihad Airways,” said the CEO of Air Seychelles, Cramer Ball. 10 June 2013. Czech Airlines & Air Seychelles enter a codeshare agreement, allowing 2-stop flights from Johannesburg to Prague via the Seychelles & Abu Dhabi. 25 April 2013. Air Seychelles & SAA enter into a codeshare agreement, the first step of which is that South African Airways will sell Air Seychelles Johannesburg to Seychelles flights on its website. 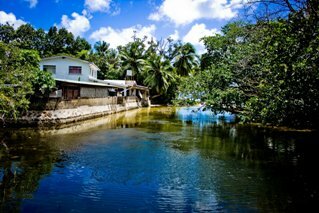 "Our flights to Johannesburg have been incredibly successful, reflecting an increasing number of travellers coming out of South Africa to the Seychelles for leisure, business and sport. Traffic from South Africa has grown at a steady pace of 11 per cent each year for the past decade. In the first quarter of this year alone, traffic is up 13 per cent. With this codeshare agreement, guests will be able to purchase flights from South African Airways destinations onwards to the Seychelles on one ticket, making for a simpler and seamless journey. We have also established a foundation for twin-centre tourism products which combine a safari in Africa with a Seychelles beach holiday. 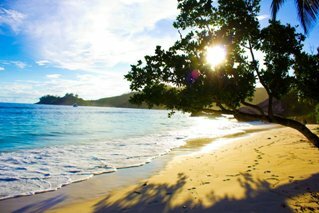 SAA Holidays will also be adding Seychelles to their holiday program, providing a new channel for selling travel to our island nation and supporting the vitally important tourism industry." said the CEO of Air Seychelles, Cramer Ball. 24 March 2013. The first Seychelles to Hong Kong flight (HM86) is launched with it flying via Abu Dhabi, and is celebrated at Mahe Airport with a Chinese Lion Dance, and the traditional water cannon salute on landing in Hong Kong. 24 March 2013. Johannesburg to Mahe flight frequency is increased to 3 a week. 12 Mar 2013. Air Seychelles takes delivery of an A330 Airbus, calling it Vallee de Mai after Praslin Island's World Heritage Site. July 2012. A new Air Seychelles A330-200 plane with the new logo painted on, landing in the Seychelles for the first time. 16 June 2012. 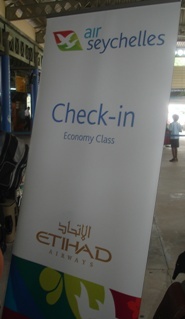 Seychelles Plus (the frequent flyer program of Air Seychelles) integrates with Etihad Guest (the loyalty program of Etihad Airways). 1 May 2012. Air Seychelles introduces the Airbus A330-200 plane on its international flights to Johannesburg. 19 March 2012. Air Seychelles announces that they plan on increasing their flight frequencies to Abu Dhabi, Johannesburg & Mauritius. 11 March 2012. Air Seychelles' partnership with Etihad Airlines requires that they align themselves with Etihad Airways' departure and arrival times into Seychelles. 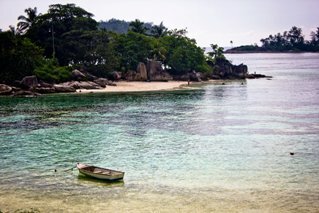 From 11 March 2012 the timings of its JNB - Seychelles flights (Sundays & Fridays) were changed a bit. January 2012. Etihad Airways purchases 40% of Air Seychelles. 1983. Air Seychelles begins a long-haul service. 1978. Air Seychelles is established. 8 November 2013. 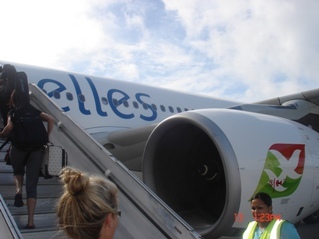 Air Seychelles reports a 42% pax growth to 99,946 in the 3rd quarter of 2013, compared to 70,193 in the 3rd quarter of 2012. Growth was largest on the international flight routes, where total passengers flown increased by 91% to 55,238 (on domestic routes growth was a milder 8%). There were large increases on the flights to Mauritius, flights to Johannesburg (12%) and Abu Dhabi (147%) routes (the airline has a strategic relationship with Etihad). "We are confident we will deliver a strong financial return to our shareholders and to our home economy," said Cramer Ball, the CEO of Air Seychelles. Whilst passengers carried increased by 42%, the airline's revenue per passenger kilometre increased by 134%. 5 September 2013. Air Seychelles increased profit by 139% in its second quarter compared to the second quarter of 2012, and attributes it to the expansion of international flights & revenue from its codeshare and equity partner, Etihad. This bodes well for SAA's strategy, which has been to accummulate a number of codeshare partners. 18 March 2013. 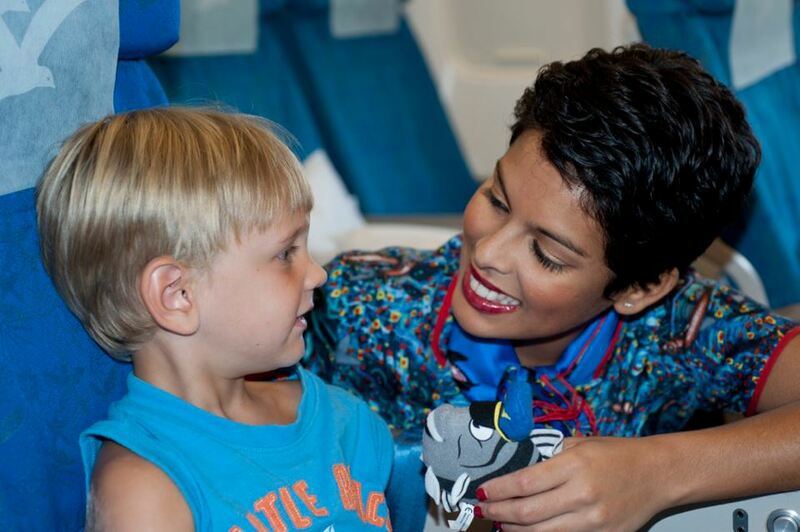 Air Seychelles reports a $1m profit. Etihad must be pleased, as they purchased a 40% stake in the airline a year ago. February 2012. Etihad purchases a 40% stake in Air Seychelles for USD45m, which previously had been 100% owned by the Seychelles government. Air Seychelles is 40% owned by Etihad Airways, the national carrier of the United Arab Emirates. Rating 4/ 5 : "Good Evening. South African Airways flight SA033 leaving at 18h50 from Cape Town to Johannesburg has been delayed until further notice. Thank you”. As I heard this announcement, I thought ‘I have a long journey ahead of me’. I grew more and more anxious as I noticed the time fly by. On my ticket, I was due to land in Johannesburg at 20h50. My connecting flight to Seychelles was leaving at 22h55. I had only two hours to collect my bag and check in. In flying time, that is only about an hour if you take into account the time it takes to land, get off the plane, wait for your bag, walk over to the international side, check in and go through passport control. I landed at O.R. Tambo International Airport at 21h30, forty minutes after I was supposed to be there. One bit of advice I would give to airlines is to let the passengers with a connecting flight leave first. 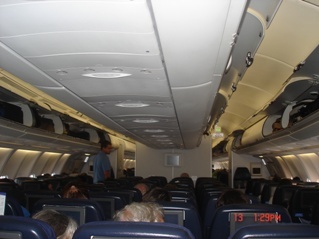 There were quite a few of us flying to Seychelles and most of us were at the back of the plane. Due to our unfortunate seating, quite a bit of time was wasted getting off the plane. I walked hastily to the conveyor belt and thought to myself that with my luck, my bag would be the last to come out. The Gods must have known my situation, as I saw my red bag appear at the entrance of the belt and I dashed to grab it. I then tried to run with a heavy suitcase, hand bag and a laptop bag from the Domestic side to the International side of the airport. If you are not familiar with OR Tambo, this takes a good 10 minutes. At this moment, a friend I was flying with decided to call and let me know that my plane was boarding already. I still had to check in and go through passport control. How would I ever make it on time? 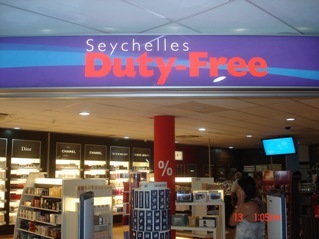 I got to the check in counter for Air Seychelles and luckily there was no queue. I noticed some familiar agitated faces from the SAA flight to Johannesburg. I got to the counter and gave the consultant my passport and placed my bag on the weighing belt next to the counter. She was cracking jokes with her buddy, whilst I was stressing that I might miss my flight. I asked her if she could check me in and possibly seat me next to my friend. My friend had asked them to put a hold on the seat next to hers for when I check in and gave them my details. Happily she asked me to go to another counter, where there was a super-efficient person working. He helped me straight away, weighed my bag, sent it through and gave me my boarding pass. Unfortunately I could not get a seat next to my friend as the flight was fully booked and they did not want to hold any seats. I ran straight to the terminal which was a good 10 minute walk away. The boarding gates were open and the waiting area in front of the gates was empty. The consultant took my boarding pass and let me through. I was just thankful I had made my flight. Etihad Airways recently went into partnership with Air Seychelles, and I am delighted to report on some immediate improvements I have noticed. I have flown to Seychelles before and the planes are usually quite cramped. Even though the seating plan is 2-4-2, the foot space is smaller and the fabric on the seats are usually torn or frayed. The plane we flew, operated by Etihad Airways was clean, stylish and spacious. Each passenger got their own earphones, blanket, pillow, socks, mini toothbrush and toothpaste, face masks and ear plugs. 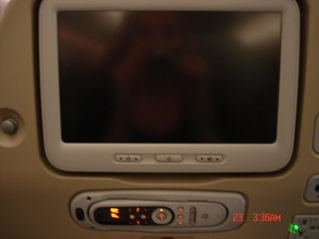 Each seat had its own interactive TV with a variety of movies, series, documentaries and music to accommodate every passenger. There was a variety of magazines kept in the back of seats for us to read - Etihad In Flight, Air Seychelles, Boutique (showing what you could buy on the plane), Formula Race Track Packages and the EBox Magazine (showing what was available on the interactive TV). I thought to myself that this was going to be a quick, easy flight. The flight was fully booked as we flew on break up day. 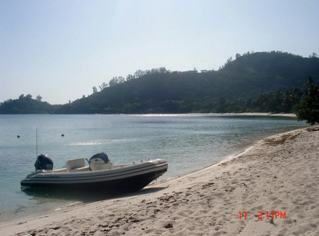 There were a lot of families flying, I guess to escape the winter of South Africa for the tropical weather of Seychelles. The advantage about flying at night is that most of the kids sleep and do not scream too much. The cabin crew made announcements in Arabic and English. They served drinks first, then dinner and lastly teas and coffees. For dinner, we had a choice of fish, chicken or penne pasta. 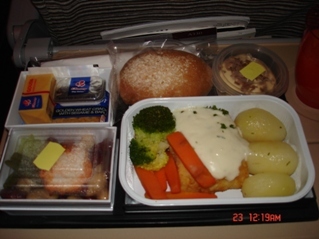 I decided to get the fish and surprisingly for aeroplane food, it was pretty tasty. Have a look at the in flight menu. I watched a movie on the flight which was a good 3 hours. My eyes were burning towards the end of the movie but I was trying to stay awake to see the end. After the movie I tried to get some sleep and maybe got an hour in. The bathrooms on the flight were very clean and a bit more spacious than others. They even offered hand sanitiser, face mist and hand cream. I thought the face mist was a nice touch especially when you have been flying for hours and need to look fresh. We had to complete forms to enter Seychelles. The questions asked were reasons for visiting, if you were carrying any items that needed to be declared and where you were staying for the duration of your stay. We also had to fill in our passport details. We landed smoothly at 05h50 in Seychelles. There were quite a few comments made, not about the landing but about the weather. 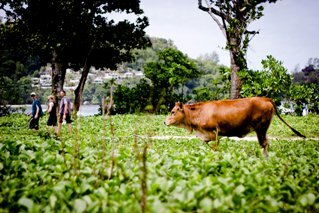 It was raining in Seychelles and to anyone who has not been there, this can come as quite a shock. 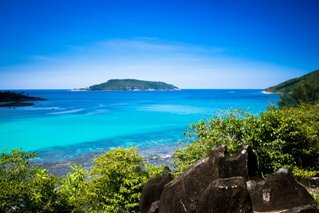 Seychelles in June/July experience their monsoon season and rain in the afternoon and evening is common. It was quick to disembark the plane as we were seated close to an exit. We walked outside and instantly were hit by the humidity. It felt good to be in a country with hot weather. We waited in a queue to have our passports checked. Once we were through passport control, we walked over to the conveyor belt to collect our bags. The flight was fully booked and Seychelles Airport has one conveyor belt, so we had a chance to catch our breath whilst waiting for our bags to arrive. 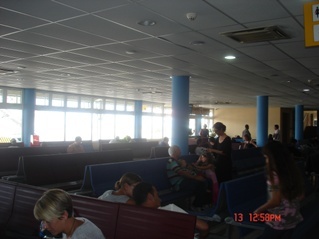 The Seychelles International Airport consists of 3 small terminals. 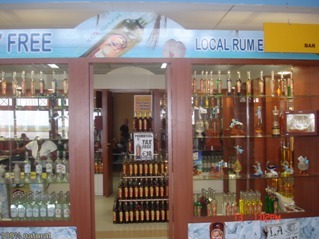 There are quite a few small duty free shops for you to do some last minute purchasing. 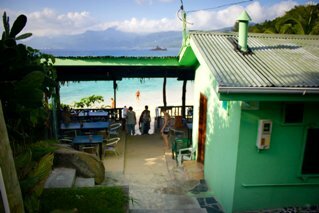 They offer items from perfumes to watches, alcolhol to cigarettes, sarrongs to 'I Love Seychelles' t-shirts. If you only have Rands with you, then you will not be able to purchase items as they accept Dollars/Euros or master/visa cards. I bought two perfumes for $84, items which would have cost me R900 each back in South Africa. I have added a bit of travel information if you are a first time flyer with Air Seychelles (note that this may have changed since I wrote it, so please check latest details with Air Seychelles at the time of your flight). The maximum weight allowed for each individual’s checked baggage is 32kgs. Each baggage item must be labelled with your name and contact details. Labels are required both inside and outside. Check in starts 2 hours before departure time as shown on the e-ticket. Flights will not be delayed for late arrivals. If your travel plans change, it would be advised to contact the Air Seychelles desk at the appropriate Airport to inform them. In Business Class (Pearl Class) Air Seychelles seats are equipped with 110V AC power outlets.